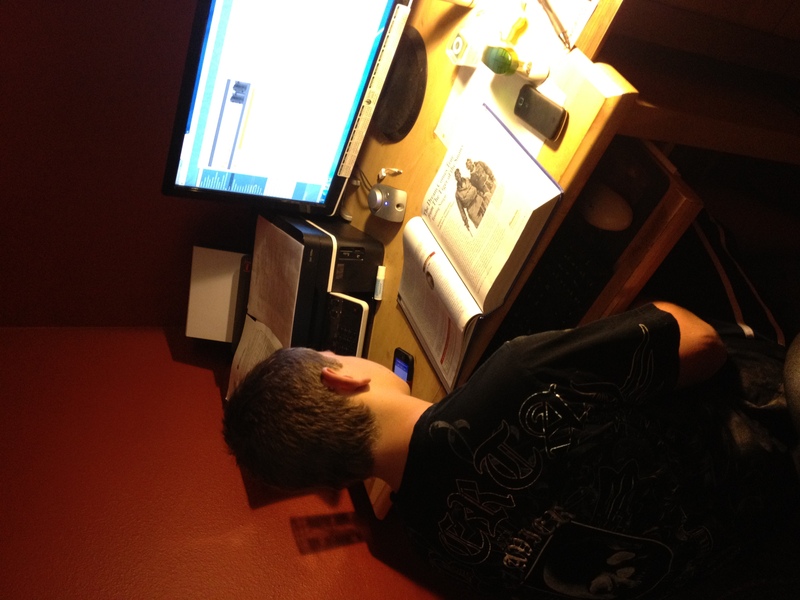 At least he’s studying…. – Trees & Flowers & Birds! Online class is in session! 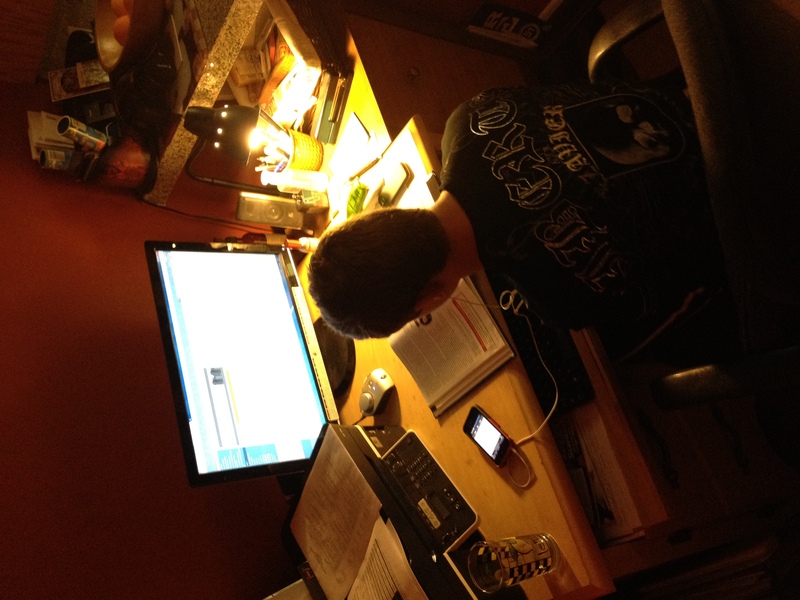 Of course, studying can’t really happen unless there is music in his ear. So, he has my old iphone 3Gs which is now basically an Ipod touch on steroids – it still has all the apps and music on it from when it was mine. His own phone is off to his right. He was working on an assignment from the online English course and had no idea I took these photos with my new iphone 4s. Gotta say I really like the camera upgrade I got on that one! Also – Siri rocks. She’s helped me setup reminders while I was driving home – because we all know that it is only while sitting in traffic that our brains engage on all those little things that need to get done – which we promptly forget when we reach our destinations. Anyhoo – that’s it for now. Between making sure he stays on task with regular classes & online, and doing taxes and web writing, I’m spent. Oh – Alex and I are running a 5k on Sunday. Both of us will not be nearly as fast as we were back in October. This course is much hillier and on asphalt vs sidewalks. And we have no clue what it looks like. The girls are running in the half marathon part of the event. They are nuts!! But, we will all have fun I am sure. My goal last time was to break 33 mins and I did it in 30.5. This time? If I do it under 40 I will be happy – if I can reach it around 35 I will be REALLY happy. My best hilly 5k time around my house is 37 mins. 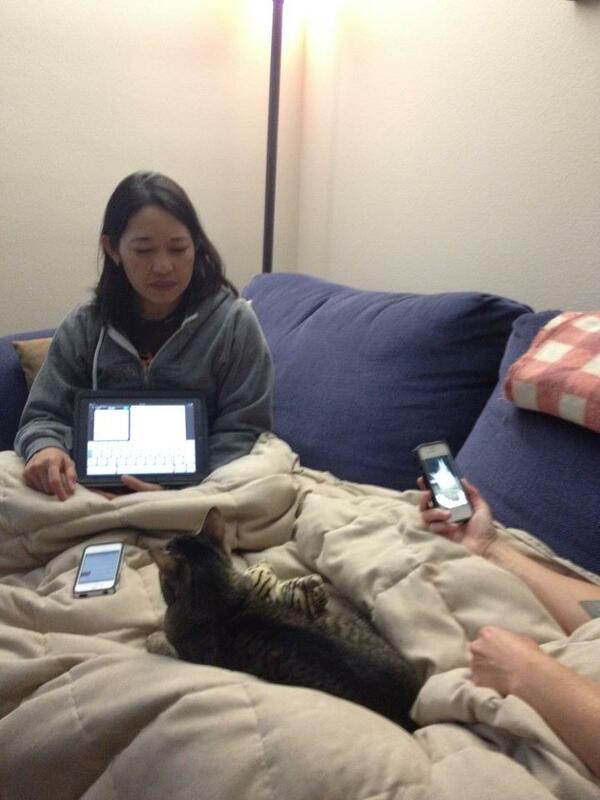 One ipad, and technically 3 iphones (the one I used to take the photo). Yes, we are NERDS!